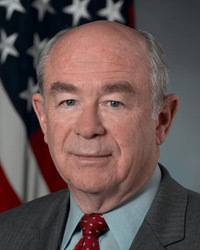 David Ahern serves as deputy assistant secretary of defense for strategic and tactical systems, working under the Office of the Assistant Secretary of Defense for Acquisition. Ahern’s office is responsible for portfolio management, technical and programmatic evaluation and functional oversight of the Defense Department‘s strategic and tactical programs. Before joining the Pentagon, Ahern served as a professor of program management and director of the Center for Program Management at the Defense Acquisition University in Fort Belvoir, Va.
At DAU, Ahern also served as an executive course learning team mentor and instructor at the Defense System Management College School of Program Management. Ahern also served in the Navy as an aviator in the RA5C Vigilante for deployments in the Atlantic and Pacific theaters and as executive and commanding officer of Tactical Electronic Warfare Squadron Thirty Three. His shore-based assignments included service as head of the tactical command and control branch on the staff of the Chief of Naval Operations; project officer in the Navy Space Project; class two program manager at the Joint JTIDS Program Office; program manager for Navy tactical data link systems; and deputy program executive officer for space, communications and sensors.